With Mateu Lahoz in Charge, Madrid has a Man Advantage over Barcelona! With Antonio Miguel Matéu Lahoz in charge, Barcelona not only have to worry about the Opponents but also a Referee who have purposefully hurt them more than once in the past. The first Clasico of 2019 will be held at the Camp Nou on 6th of February, Wednesday in the First leg of this season's Copa del Rey, semi-final. This will start one of the toughest period for Barca which include three Clasico clashes in 25 days and also matches with Athletic, Valladolid, Lyon, Sevilla in between them. And that makes it essential to start on the front foot in Wednesday's match so that we can selectively rest our crucial players. The likes of Messi, Alba, Busquets etc. have no replacement in our squad and which means that we need to prioritize matches where these stalwarts need to be taken off or even rested completely. With such a tough run of the fixture, the chances of that appear minimal. The best case scenario for Barcelona would be to perform really well in the first leg on Wednesday and win the match with at least a couple of goals margin. That will easily make the second leg almost a dead affair. That means even players are not rested, they still go slow on intensity during the match. Now it appears that we have an additional problem in our hand to deal with apart from Real Madrid. 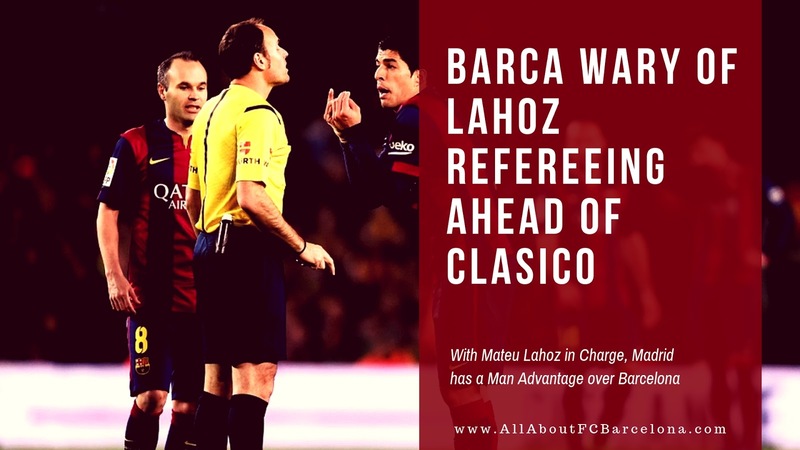 The first leg will be officiated by the controversial Matéu Lahoz, who have in the past tried to hurt Barcelona with his indifferent refereeing. With him around, Real Madrid will be having a man advantage and the thugs like Casimiro and Ramos can go on kicking our players at will. He is consistently known for allowing kicking of Barca's players by the opposition. Last season, we had the worst experience with him in the match against Las Palmas. His officiating came under heavy criticism even from his own fellow colleagues. Many pundits even wondered whether he is doing it purposefully to hurt Barcelona. Pique was quite certain, and the Players and Coaching staffs had to restrain him from unleashing himself on Lahoz after the match. Barcelona needs to be double smart in this match. They should assume that despite all the kicking not a single foul will be called against Real Madrid. That means we need to be a bit more physical and make sure to protect the ball at all the cost. Whatever Lahoz has in his mind, if we play in full form, not even this scumbag is going to hurt us.